Jaane Doe has been part of the musical machinery in the U.S. for more than three decades, continuously re-inventing herself to stay in the game. Jaane Doe has been heard from East Coast venues such as the Guthrie Center, and the famous Caffe Lena in Saratoga N.Y. to the West Coast playing The Mint, The Roxy The Whiskey, The Coach House, and The Troubadour where folk icons such as Tom Rush, Don McLean, and Arlo Guthrie have graced the stage. Successful endeavors of the past include 1988 record contract with Rhino/Rampage as the lead singer of the Metal band CRISIS, and major contributor to “Old Dogs New Tricks Productions,” a company founded by Jaane Doe and Joe Schermie, original bass player for THREE DOG NIGHT. The album project, BURNS LIKE FIRE signals Jaane Doe’s dynamic return to the music world and her debut as a solo artist. In the span of her career, she has worked with, or opened for some legendary names in the music business including Motown Producer Bobby Taylor (writer/producer of ABC by the Jackson Five) Don Was, original members of “Three Dog Night” Joe Schermie (bass) and Floyd Sneed (drums) Soko Richardson and Joe Kelly of the “Ike and Tina Turner Review”, The Chambers Brothers, Bob Weir, Dwight Yoakam, Red Hot Chilie Peppers, Wayne Devillier (music director for Al Hirt) Tommy Chong, Matt Smith, Sweet Pea Atkinson,Harry Bowens, Eric Andersen, The Waters, Andrew Berliner, Roger Fischer and Michael Derosier (guitarist and drummer for HEART) Sarah Lee Guthrie, and Johnny Irion, Lorne Entress, Paul Kohanski, Terry Hall (drummer for Arlo Guthrie) and Annie Guthrie. 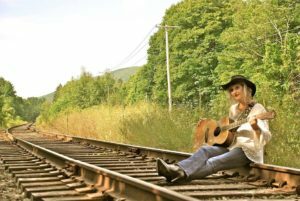 Though her solo album BURNS LIKE FIRE, is her latest incarnation in the Americana genre, Jaane is currently working on a new album project… stay tuned!! !